The other day we received a call from the local Hilton Hotel looking for a solution to their dirty grout lines and marble tiles in the hotel lobby. 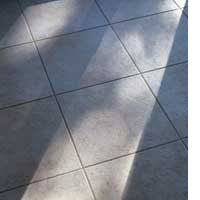 They had tried a number of products including grout cleaner and harsh chemicals - even full strength! - but nothing was cleaning the grout to their satisfaction. The hotel maintenance manager was anxious to find a solution to their grout problem in time for an upcoming facility inspection by corporate staff. We sent our technician over with some EATOILS™ SUPERFRESH™ and in less than five minutes the staff and management could see a dramatic difference with our product diluted at just 2 ounces per gallon. For difficult to clean situations you might try a more concentrated blend. Our GREENER-CHOICE™ APPROVED GREEN cleaning products outperform traditional cleaners every time! They were so happy with the results that they purchased the product right out of the technician's hands and began working on their floors right away. This is actually quite a typical scenario for our products - a short demo is usually all you need to show how well our products actually do the job! - How about ordering some today? Click here.